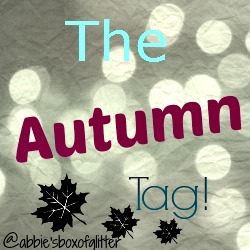 This is The Autumn Tag! I was tagged by Bess Oates so I think you should go and check her out! 1. Favourite thing about it? The cold nights and being able to wear boots and snuggle in bed with a hot chocolate and watch films! 2. Favourite drink? Hot Chocolate! 5. Go to moisturiser? Face: Clinique dramatically different moisturizing lotion. Body: Avon Skin so Soft silky moisture. 6. Go to colours for the eyes? Browns and if I’m feeling brave then a plum purple. 9. Autumn treat? I would really like to get some biker sort of boots this year, I was going to get some last year but I never got round to buying a pair . So hopefully this year. 10. Favourite place to be? By the fire with a hot chocolate or in bed with a hot water bottle. I tag all of you guys to do this tag!